How is mixing in surround different than stereo mixing? There's more to it than you might think. Find out how to mix for 5.1 and 7.1 surround sound, create realistic spatial effects, and avoid phasing issues and other pitfalls. Think that surround sound technology is something new? Think again. It actually made its first public appearance way back in 1941, with Disney’s groundbreaking animated film, Fantasia. Of course, there have been many significant developments since then, and today surround sound is an integral part of motion pictures, gaming and more. The prevalence of home theaters has also meant that surround playback systems have become increasingly affordable. And even though it has never quite caught on as a music-only format (at least not yet), there are still lots of new recordings being released in surround on DVD and Blu-Ray discs, not to mention remixes of legacy stereo albums such as the 2017 re-release of The Beatles’ Sgt Pepper’s Lonely Hearts Club Band and the 2012 re-release of Rush's 2112. As you make the transition from stereo to surround mixing, here’s a look at some of the most important rules to follow... and the problems to avoid. The subwoofer (which carries the “LFE,” for “Low Frequency Enhancement” channel) can be positioned pretty much anywhere in the room, since the low frequencies it generates are more or less non-directional – that is, it’s tough to determine where they’re coming from anyway. Blu-Ray discs allow for the storage of more data, which has given rise to the 7.1 format, where two more output busses are required and two extra full-range speakers are added to the array, called “surround left” and “surround right.” These are positioned off to each side of the listener, kind of like a big pair of headphones. Even 10.2, which adds two front “height” channels, two front “wide” channels, and a rear center channel. A few years ago, Dolby and DTS introduced new “audio object”-oriented surround formats called Atmos and DTS:X, respectively. These have found favor in the cinema and gaming worlds and are incorporated in a growing number of home theater products. Both add two or more ceiling-mounted, or upward-firing speakers for the added dimension of height. Such arrays are termed “5.1.2” or “7.1.2,” with the final digit representing the number of height speakers. Unless you’re specifically doing professional-level mixing for one of these formats, you don’t need to worry about the extra output busses and physical speakers since such channels can be derived digitally through encoding processes. A standard 5.1 or 7.1 configuration should work just fine for most Atmos or DTS:X projects. The same caveat to stereo mixing applies here, only more so. Make sure your monitoring speakers are positioned, angled and calibrated correctly! If you don’t take this important step, your surround mix will not translate well to other environments. Positioning recommendations and calibration instructions are beyond the scope of this article, but there are many online resources that will give you direction. Another good starting point is the NARAS “Recommendations for Surround Sound Production” document, which you can find here. In addition, tools like the M360 Surround Manager can be helpful for achieving optimum placement, balance, and spread in your studio. Many people are surprised to learn that the sweet spot is actually smaller when monitoring over more than two speakers. This is largely due to the shape of the human head and the positioning of our ears – we simply don’t hear things off to the sides or behind us as well as sounds originating from in front. Once you realize and accept this, a broad range of sonic opportunities present themselves. After all, what’s wrong with a listener in the back of the room hearing a slightly different mix than one sitting in the front of the room, as long as both mixes are cohesive and present the same essential balance? That’s what happens in concert halls and other large venues, after all: everyone is hearing the same performance, only slightly differently, depending upon where they are seated. And if you think about it, there’s something undeniably cool about being able to get up and walk around a room and hear the mix change a little as you do so. In fact, that’s something you should do every now and then while creating your surround mix: don’t just sit in your chair as if nailed there. Enjoy the freedom that surround sound brings! Today, mixers aren’t limited to relying on a full surround mix facility to accurately carry out surround mixing tasks. The Nx Virtual Mix Room plugin carefully depicts all the qualities of 7.1, 5.1 and 5.0 surround environments and how our ears perceive them, decoded for reproduction onto stereo headphones. 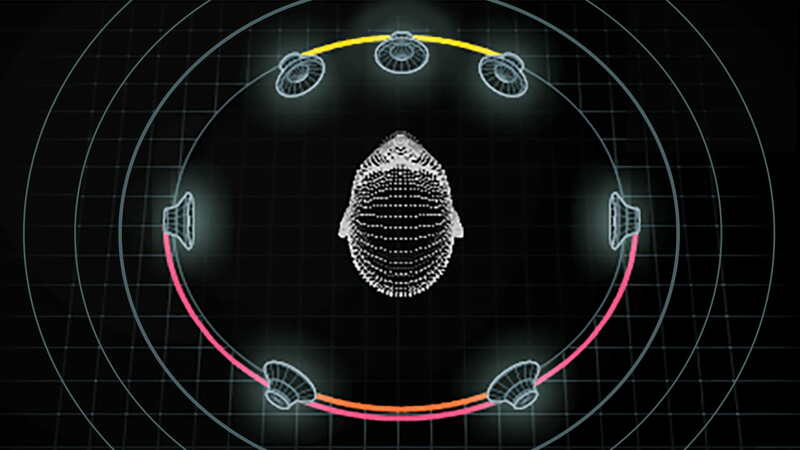 Better yet, with the Nx Head Tracker connected with your headphones, your head movements are communicated via Bluetooth to the Nx plugin, so that when you move around in the surround environment, all the details of surround mixing are present in their proper spatial placements. Whether working on mixes away from the studio, or as a secondary reference to a physical surround setup, Nx can be an invaluable tool for surround mixing – especially as there’s an increasing chance that some end-users will experience the material with similar playback methods. For some projects, you want to put the listener in fifth row center. For others, you want to put them in the center of the band onstage. And there will be times you won’t want the listener any particular place at all. The approach you take – realistic, hyper-realistic, or completely unrealistic – depends largely upon the project, but it’s a decision you should make very early on, even before you start mixing. When mixing live performances for surround sound music releases, realism (or, at best, a conservative type of hyper-realism) is probably a good goal. In those circumstances, you want to pay special attention to audience microphones in order to construct a believable virtual space. Studio recordings are a completely different animal; here, you can go for anything from “listener in the center of the room with the musicians all around” to sounds bouncing and panning all over the place in a sonic universe of your creation. Of course, when mixing for film or gaming, you need to be conscious of the proper positioning of the various elements within the surround sound field, and audio for film is always built upon the unbreakable dictum that dialog is king, so you need to have all the elements fit around it and not obliterate it. Other than that, there are no hard and fast rules. One cool approach is to think of surround sound mixing as similar to using different camera angles. Sometimes getting up close and personal is best, while other situations call for a wide panoramic shot. Whatever you do, make a statement; but make sure it’s a tasteful one. Don’t just do things for shock value; make sure your mix contributes aesthetically and musically. Years of stereo mixing have taught us that the way to get a signal to appear directly in front of us is to route it at equal strength to the left and right channels, thus creating a phantom center image. This still works just fine when mixing in surround, but the difference is that you now have a discrete center channel feeding a real speaker physically located between the front left and front right speakers. So what’s the best way to pan center? Well, like so many other things in surround mixing, it depends. One factor to bear in mind is that the center channel speaker in many home playback systems – particularly “home theater” ones – can be entirely different from the other speakers due to space considerations and may even be voiced for speech rather than music. In such cases, audio coming from a real center speaker exhibits a slight midrange bump as compared to a sound appearing from a phantom center – a phenomenon that can tend to make vocals somewhat harsh. There’s also an inherent problem with a phantom center in that it only works for listeners in or near the sweet spot; someone seated close to the left speaker, for example, will hear the signal as coming from that speaker alone. So if someone moves around the room, signal coming from the real center channel will remain fixed, while phantom center signal would shift, skewing the soundstage. For the reasons given above, you may want to avoid using either the center channel or phantom center on their own. The best solution often comes from using them in conjunction with other channels. Divergence – a multichannel panning feature offered by most DAWs – provides an elegant way to accomplish this. This control allows you to “bleed” selective amounts of signal from one channel into adjacent channels. So, for example, you can send all the elements you want coming up the middle to the “real” center channel and then adjust the divergence control on those elements to bleed into the L/R a little, say at around -6dB relative to the real center. Before we leave this topic, let’s talk briefly about whether or not it’s possible to create a phantom center in the rear channels; after all, surround sound systems incorporate two speakers behind you. The answer is... sort of. Signal sent at equal level to the two rear speakers will appear to be somewhat centered behind you, but with much less image stability – perhaps two-thirds of what you get from a front phantom center. This, once again, is due to the physical shape of the human head and the placement of our ears. One guaranteed way to ruin your surround mix is to send signals to multiple channels – especially adjacent channels such as the center, front left, and front right channels – at equal level. Doing so will almost always result in some frequency components cancelling out, resulting in comb filtering and a very evident “hole” in your mix, particularly as you move your head around. If you’re going to send a signal to multiple channels, either do so at differing levels, or delay the signals slightly – optimally somewhere between 12 and 48 milliseconds. The human brain registers this as natural reflections, just like in a real space, and comb filtering will be at least minimized, if not completely eliminated. Another great way to create a sense of a room is to use a reverb specifically designed for multichannel applications. The Waves IR360 Surround Convolution Reverb is an example of this. It delivers the sampled sound of world-famous venues and includes over 100 impulse responses of spaces and devices – you can even capture, import and create your own reverb spaces, with extensive control over early reflection and decay time, all while preserving natural envelope and frequency content. Another good option for surround mixing is the H-Reverb plugin, which lets you shape and customize the decay envelope beyond the standard linear forms for gated, reverse and unusually dense reverb tails that don’t muddy up the mix. Other unique features include pre-delay BPM sync, resonant filter sweeps, and an EQ and dynamics module for compression, ducking and de-essing. Even if you don’t avail yourself of a multichannel reverb, you can simulate one with the use of multiple stereo reverbs, though the results may not be quite as phase-coherent. For example, you can assign a short reverb to the front left/right channels, and a very long reverb to the rear channels with a 100 or 200 hundred millisecond pre-delay to help differentiate between the two. Additional reverbs with differing reverb times and pre-delays can be assigned to the center channel and/or to the surround channels in a 7.1 system. But unless you’re going for something totally off-the-wall, try to avoid getting too gimmicky: Tweak the settings of each reverb so as to create a sense of a real (or at least realistic) acoustic space. 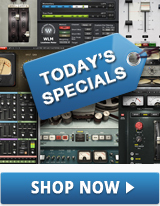 One of the big surprises to surround mix newbies is that you need way less compression and EQ. No longer are you having to slice and dice frequency bands and minimize the dynamic range in order to cram lots of elements into just two speakers. No longer do you have to work hard to give everything its own “space.” With six or more channels (and speakers) at your disposal, the music – and all of its components – has a lot more opportunity to breathe on its own, without you having to force the issue. The converse is true as well: If you overcompress in surround, the overall mix becomes bland and difficult to listen to. You’ll find that the “glue” in surround mixes is a lot more subtle than it is when mixing in stereo. One of the first things most newcomers to surround mixing do is to reach for the joystick (or virtual panner) and start flying sounds around the room, expecting them to begin whizzing overhead in circles. The reason, again, is the shape of our heads and the positioning of our ears. We simply don’t hear things above us, behind us, or off to the sides nearly as well as we discern sound coming from directly in front. As a result, a “flyover” from front to back (or diagonally – say, from front left to rear right) just gives a hazy impression of motion, with a big hole in the middle where the greatest phase cancellations occur. Ditto for circular movements: they don’t sound anything like circles, just a vague (and oddly disconcerting) shifting of the signal from one spot (sort of) to another spot (sort of). So if that’s your plan, abandon it. Panning can work well in surround, but only between front left and right (boring!) or, to a lesser degree, directly adjacent channels; and even then, only when done sparingly and with great care. In some circumstances, you may need to boost the level of the signal as it moves towards (or away from) a particular speaker; in other cases, you may need to delay it slightly, or even reverse its phase. In short, it takes a lot of work to get a surround flyover to work even halfway decently – probably a lot more work than it’s worth, in most instances. Creating surround mixes from mono sources is a lot easier, and a lot more effective, than creating one from stereo sources. For that reason, consider reducing your beautifully recorded stereo piano down to an equally beautiful mono version before starting your surround mix. Ditto for stereo guitars, stereo keyboards, stereo backing vocals, etc. Doing so will allow you to construct a more impressive surround field, with a lot less need for compression, EQ, or other types of processing. As its name implies, the LFE, or “.1” channel should be thought of as a special low-frequency effects channel. It’s also one that you shouldn’t rely on too heavily since you have no way of knowing if the user’s subwoofer is calibrated correctly, uses the same frequency crossover point as the one in your studio, or even if it is being used at all. That doesn’t mean you should ignore it, however. Even if you don’t create an LFE channel, there’s a good chance the user (or, more specifically, the user’s system) will create one for you, which could mess up your mix altogether. Here’s the deal: Many consumer playback systems use satellite speakers for the rear and/or surround channels – speakers that, unlike the others in the system, are not full-range and are usually quite lacking in low end response, meaning that a subwoofer is necessary to enjoy the entire signal. These systems also assume that if a subwoofer is connected, the user wants to hear rumbling. If there’s no LFE channel, bass management systems are used to derive one from the low-frequency content in the front left/right channels (and sometimes from the center channel as well). Regardless, it’s always best to create an LFE channel. 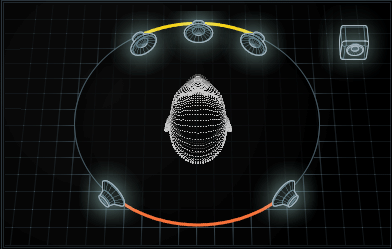 The Waves LFE360 Filter plugin provides a number of precision tools for this purpose, or you can simply send a band-limited mix of whatever low frequency signals sound good to you: generally, kick drum and bass guitar or synth fundamentals, supplemented by the odd tom-tom hit or explosive sound. 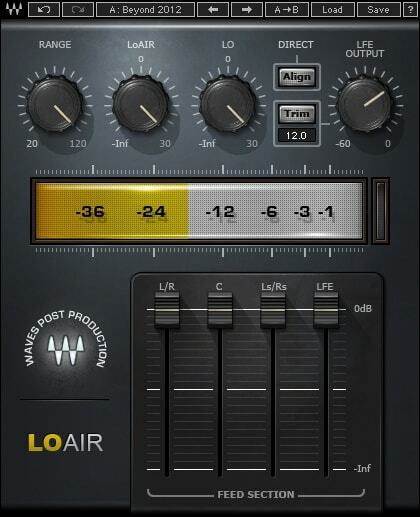 If there isn’t sufficient low end in the various sonic elements you’re mixing, consider using a subharmonic generator like LoAir, which lets you process polyphonic content to enhance low end in a natural and musical way. Do this, and if the end user happens to have a correctly calibrated subwoofer connected, and if that subwoofer’s crossover frequency is the same (or close to) the one in your studio (80 or 120 Hz are most commonly used), they will hear the mix pretty much as you intended it. If not... well, you can only hope for the best. But at least the LFE signal will be one that you custom-created, not one solely dictated by the circuitry in their playback system. Above all, be creative! Surround sound is a medium that positively invites exploration, even if your intended approach for a project is a conservative brand of realism. Whatever you do, try to create an immersive experience that can be appreciated from a variety of angles. Some prominent experts in the field view surround mixing as coming up with a choreography for multiple loudspeakers. Others view it as a series of stereo “planes” that run in multiple directions – not just left/right and front/rear, but between the front right and the rear right speakers, or from the front right to the rear left speaker, etc. 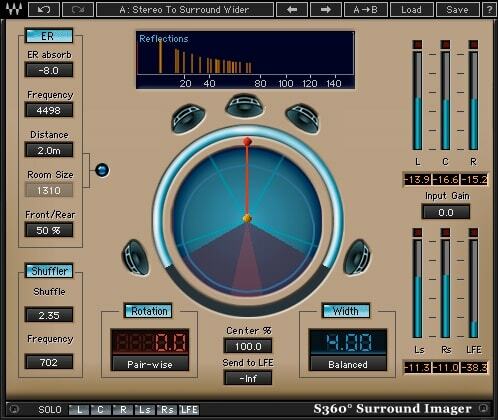 Tools like the Waves S360° Surround Imager and Panner plugins enable the precise manipulation of imaging, distance panning, and spatial enhancement for surround sound. They can also be used to generate early reflections and employ shuffling controls to increase low frequency width and perceived depth. There are no definitive rules about placement within the surround field, but in general try to keep the steady groove in the front and use the rear channels for percussive accents, backing vocals, and for spreading the mix out far and wide. Avoid routing any essential steady rhythmic elements into the rears wherever possible, because in large rooms, the distance between the front and rear speakers can make the song feel rhythmically unstable. Try putting the drums in the rear for part of the song, and in the front for other parts. Add depth to a lead vocal by routing it in mono to the center channel, then add a little bit of it in stereo (perhaps with the use of a stereo reverb) to the rear speakers. This tends to bring the vocal out in front of the listener’s face and also spreads it out a bit without the danger of comb filtering. Try the opposite approach with instruments: Pan them in stereo to the rear speakers and then add a little to the center channel at a much lower level to bring them forward a bit. If you have an instrument recorded in stereo, pan it hard left and right to the front speakers, then feed the signal to a stereo reverb and route the returns to the rear speakers. In a similar vein, route stereo drums to the front speakers and room mics to the rear speakers. Having dry signal come from two speakers and ambience coming from speakers in different locations can create a strong enveloping effect. In a 7.1 system, treat the “surround” speakers off to the sides as if they were an oversized pair of headphones. They represent the perfect place for you to hide that all-important “ear candy” in every mix. If you’re like most audio professionals, once you get into surround mixing, you’ll have a hard time returning to boring old stereo. Time to push some boundaries! Now that your expertise in surround mixing has come full-circle, so too can your audio; see our intro guide to mixing in full 3D immersive audio for VR and other applications.